efficiency and diversity of services offered. First specialists in welding equipment and gas distribution, the company cautiously migrated in 1993 to the industrial machine tools field. Merging brilliantly these two areas of activity for several years, it was in 2006 that Soudogaz really took its place in the industrial market in Quebec City and its surroundings, settling on the south shore, more precisely in St-Lambert-de-Lauzon. With a warehouse also use as a store of more than 18 000 square feet, Soudogaz enters the industry of large machine tools distributors. In May 2012, Soudogaz disposed its welding division to focus on selling and repairing machine tools of all kind. The construction of another warehouse including a showroom in Saguenay was also a part of the 2012 additions. 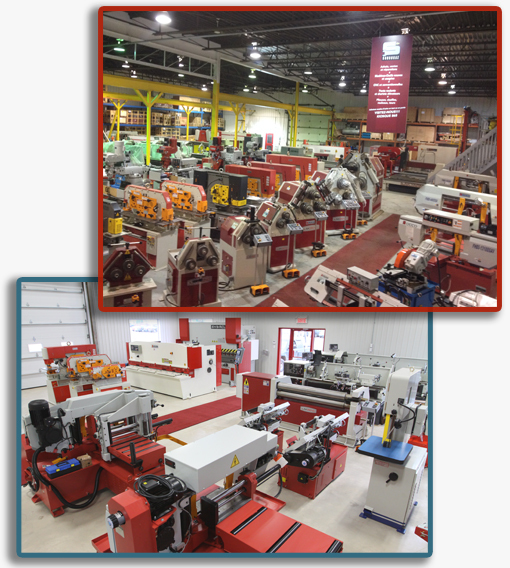 During all these years, Soudogaz has built an enviable inventory as well as acquired an unparalleled experience in the sector of industrial machinery throughout Eastern Canada. At Soudogaz, we have been building a true partnership with our machine tools suppliers for several years. This unique and privileged relationship also benefits our customers for their greater satisfaction. It is the quality, seriousness and respect for the clients that prompted us to select those suppliers so we could meet the increasingly specific need of today’s markets. Therefore, our suppliers are real leaders in their field and work in collaboration with the world’s largest electronic, hydraulic and mechanical equipment manufacturers. These constructors are constantly developing the modernness and performance of their machinery so they can always reach your expectations.